I’m finally back blogging after a 6 month “break”. I can find a million reasons (and excuses) for taking this break but the biggest one is that I needed the mental space to focus on other changes going on mostly with work, that had me, well you could say… mentally preoccupied. 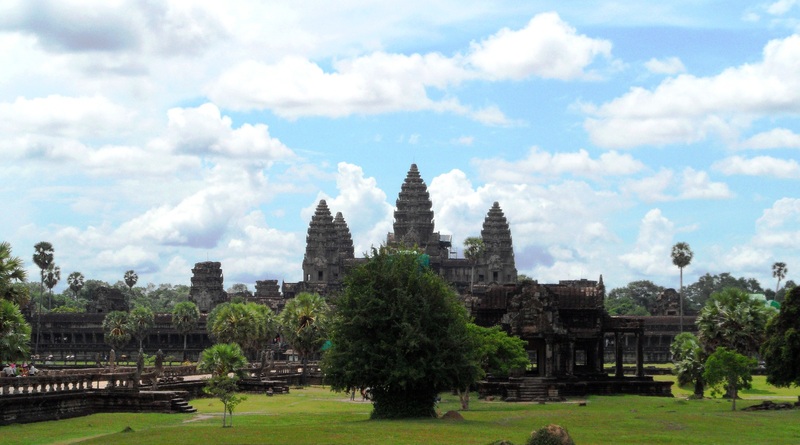 The mystery and grandeur of Angkor Wat had been a vision in my mind and in my dreams since I was a child. I would lay down in the grass on the banks of Edinboro lake in front of my house and daydream away that I was exploring these distant temples in Cambodia. At the time I didn’t know where the temples were, nor was I even able to read about them yet, I had only spent hours pondering photos of them in the National Geographic magazine in my Kindergarten class – and I knew I would someday experience them and the distant land they exist in. I’ve already shared with you some of my reflections from my journey in Cambodia but this one memory in particular has fleeted back in my mind from time to time. It tends to find its way back to me when I’m in need of purity, and a reminder of the beautiful moments in life. It was summer in Siem Reap when my plane hit the runway for its landing. As we exited the plane, the thick hot air hit me in the face and the paved air strip was all a mirage from the heat… welcome to Cambodia! Here I was, finally, after over 25 years of daydreams. We made our way to the quaint Siddarta Hotel/B&B that was located on the road that connected Siem Reap and the massive temple complex known as Angkor Wat. The sun was already setting by the time we got settled, just one more day of anticipation. We awoke very early, had breakfast, and headed off by bicycle along the forested roads that brought us to the temples. As we meandered along the roads, other bicycles would pass by carrying large baskets of deep-fried insects, chickens in rattan baskets, and even whole pigs tied to the handle bars. As we entered the temple complex monkeys would run out from the forest and into the road attempting to get our attention. I’d gaze out into little clearings in the trees and spot a number of makeshift shrines with buddha statues of all sizes amid tall grass and trees. It was enchanting, and already my childhood daydreams had come true. 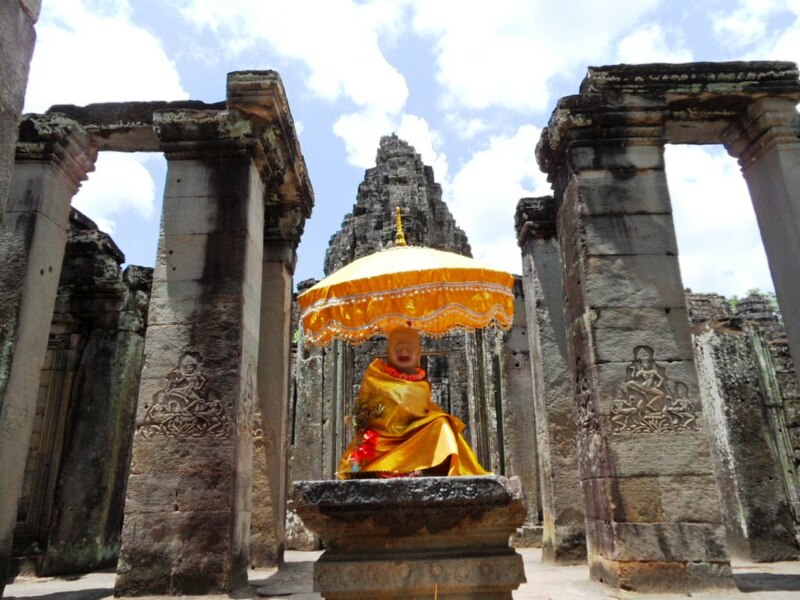 The complex of temples and ruins in Siem Reap is massive, consisting of 20+ square miles of ancient ruins spread out in different areas connected by a system of ancient and modern roads. After getting my 3-day “all you can wander” pass, we headed off to the first (and most renowned) temple complex – Angkor Wat. We locked our bikes together just outside the entrance and off we went wandering around by foot. As I stared out over the moat while crossing an ancient stone foot bridge my mouth dropped in awe. History and daydreams came alive before my eyes. We spent several hours making our way through this incredible temple complex. 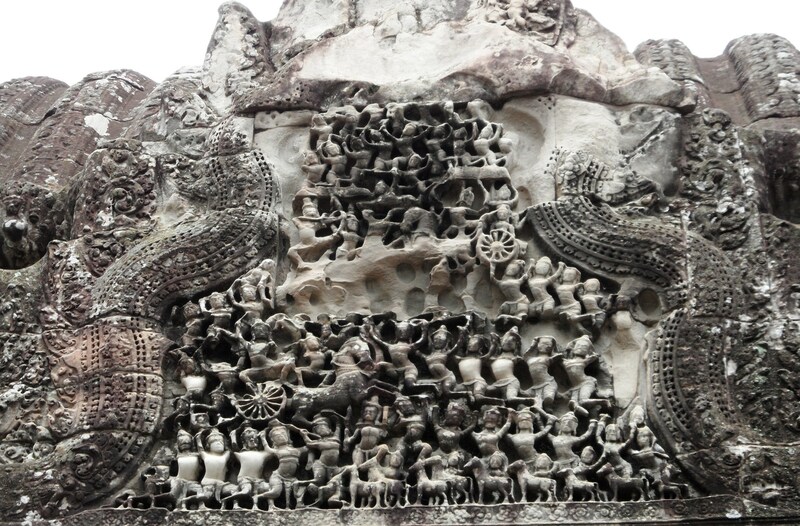 Tucked away in little nooks and crannies were the most ornate stone carvings of buddhist and hindu figures. Occasionally we’d come across a giant stone buddha statue adorned in yellow garment with gold and green decor, giving the statue a distinct aura. After several hours of wandering around, clouds began to roll over the skies and before I knew it, rain was pouring down from the heavens. This was a moment I wanted to savour forever. I found a spot on the cold stone temple floor and laid down for a rest. There I was, in the middle of the temples of Angkor Wat, taking a moment of solitude as the rain came down and cleaned away any sense of worry. I watched the raindrops soothe as the journeyed into the porous ancient stone that surrounded me. The music of the afternoon rain soothed my mind. Life suddenly came into perspective and my heart was at peace. This very moment, now a memory of an experience lived, was one I had never dreamed of. The simple beauty of a surprise.